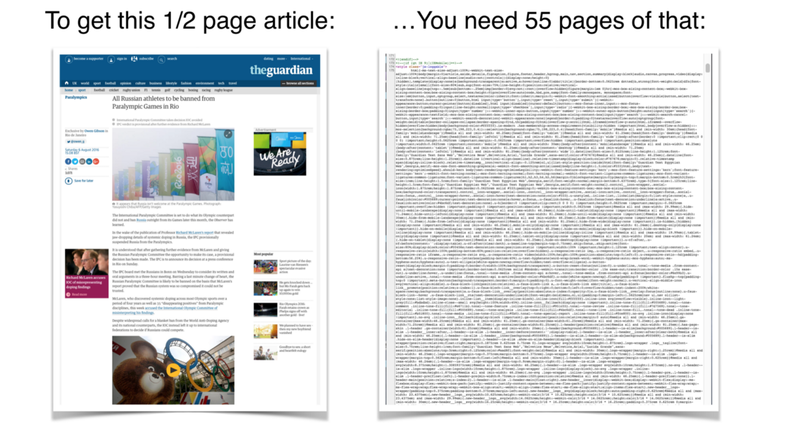 When reading this 800 words Guardian story — about half of page of text long — your web browser loads the equivalent of 55 pages of HTML code, almost half a million characters. 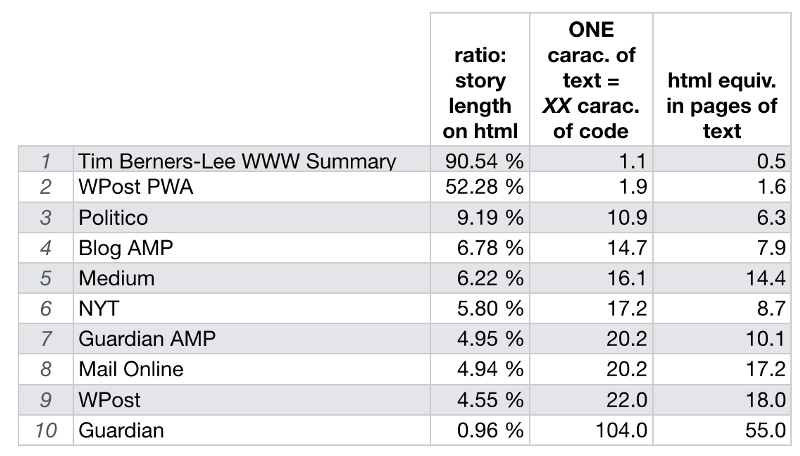 To be precise: an article of 757 words (4667 characters and spaces), requires 485,527 characters of code ... “useful” text (the human-readable article) weighs less than one percent (0.96%) of the underlying browser code. The rest consists of links (more than 600) and scripts of all types (120 references), related to trackers, advertising objects, analytics, etc. But he ends on a somewhat less despairing note. Follow me below the fold for a faint ray of hope. In due fairness, this cataract of code loads very fast on a normal connection. The Guardian technical team was also the first one to devise a solid implementation of Google's new Accelerated Mobile Page (AMP) format. In doing so, it eliminated more than 80% of the original code, making it blazingly fast on a mobile device. implements all of AMP's best performance practices, manages resource loading and gives you [custom tags], all to ensure a fast rendering of your page. Among the biggest optimizations is the fact that it makes everything that comes from external resources asynchronous, so nothing in the page can block anything from rendering. 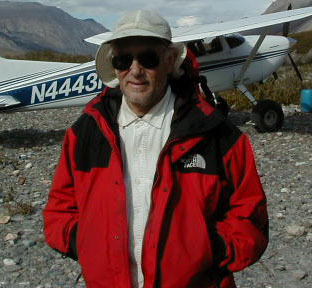 Other performance techniques include the sandboxing of all iframes, the pre-calculation of the layout of every element on page before resources are loaded and the disabling of slow CSS selectors. some HTML tags are replaced with AMP-specific tags (see also HTML Tags in the AMP spec). These custom elements, called AMP HTML components, make common patterns easy to implement in a performant way. fetches AMP HTML pages, caches them, and improves page performance automatically. When using the Google AMP Cache, the document, all JS files and all images load from the same origin that is using HTTP 2.0 for maximum efficiency. the page is guaranteed to work, and that it doesn't depend on external resources. The validation system runs a series of assertions confirming the page’s markup meets the AMP HTML specification. As an admittedly biased reference point, I took one of the first texts, World Wide Web Summary, written in HMTL by its inventor Tim Berners-Lee. Published in 1991, it probably is one of the purest, most barebones forms of hypertext markup language: less that 4200 characters of readable text for less that 4600 characters of code. That’s a 90% usefulness rate as shown in the table below (you can also refer to my original Google Sheet here, to get precise numbers, stories URLs and formulae). The big surprise (at least for me) comes from the Progressive Web App implemented by the Washington Post. The Plain HTML page offers roughly the same content as the PWA version, but with a huge gain in HTML size. It is clearly capable of impressive performance gains, with only about 1 byte of crud for each byte of content. Filloux's equivocal about the prospects for AMP and PWA. Although Google has ways of punishing sites that don't get with the program, I'm more pessimistic. The tools people use to generate their pages emit HTML that is just brain-dead (e.g. the same enormous <div> specification on adjacent phrases). Only people who simply don't care could put out stuff like this.